I gotta tell ya… it’s very exciting to me. We recently wrapped up a consulting project for Ziglar, Inc. And I’m still pinching myself. I’ll never forget the first time I heard Zig Ziglar’s distinctive voice… I was in middle school in Texas, and we got a 2-minute dose of “I’ll See You at the Top” every single day on the announcements. He had an impact on me way back then, and has continued to do so throughout my life. I’m grateful to the Assistant Principal of the school who made it a point to infuse every day with Zig’s positive, insightful, motivational wisdom. Working with the Ziglar team, they tell me that everybody has a Ziglar story. Whether it happened through one of his famous live talks to audiences numbering in the tens of thousands, or through one of his best-selling books, or through one of his audio series, when someone contacts Ziglar, Inc. they have a story to tell about something that changed their life. Many times the stories are quite dramatic. Of course, there’s much more to the Ziglar organization than just Zig’s speaking and his books, CDs, training programs and audio downloads. They offer world-class corporate training solutions for just about any size business — and I do mean any size. And they’ve recently begun conducting webinars featuring both their top-flight in-house experts as well as outside experts. Hosting the event will be CEO Tom Ziglar, who tags his blog posts, “Proud Son of Zig Ziglar.” Tom is now tasked with taking their business into the future and has quite the vision for the impact they — as a company — can have. He’s been handed the reigns of a multi-million-dollar business and handles himself without any of the awkward trappings that are typical of someone who has grown up in the shadow of a household name. It’s an honor to be associated with him and with the phenomenal team he leads. In any case, if you’re looking to make the transition into how to thrive in the 21st-century… in any economy, then I hope you’ll join us. The 90-minute event will be jam-packed with practical information that you can put to use right away in your business. The Top 5 Mistakes Businesses Make When the Economy Goes South… and how to avoid them! Why Things That Worked 10 Years Ago… 5 Years Ago… Even Last Year Don’t Work Anymore… and what you can do about it! How to Make Sure that the People Looking to Buy What You Sell Find You… Instead of Your Competition! and, of course… much, much, more! 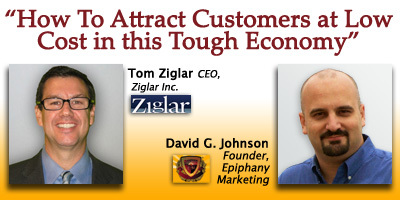 Courtesy of Ziglar, Inc., this event is being made available absolutely free of charge. 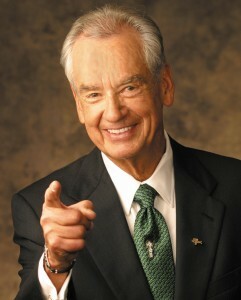 Check out all the details… along with a quick video of Zig and Tom Ziglar right here! Oh… and you’ll want to reserve your spot early, because the 2 time slots will fill up quickly!